I am sure I am not the only person who has the all-to-often “Gosh the bananas have ripened already?” problem. So … what to do? One common solution is banana bread. Everyone loves it, right? My sister Sarah included this recipe in the 2nd edition of the Borg Family Cookbook (seriously … one of the best ever) and it is exactly as the title claims: EASY. Not only is it quick and simple to put together but it always turns out wonderful. Ummmm … Maybe too much so because I think I ate half the loaf myself last night. Preheat oven to 325 degrees and butter your loaf pan (or use parchment paper which is my usual way). Bake for 1 hour. We were chatting in her kitchen (the usual spot) when my Aunt Denise started to make one of her newest creations … an apple dip. At first I was skeptical because the only apple dip I had ever had before was the super-sweet-sticky versions found in grocery stores (not my favorite). Well … I almost wish I hadn’t tried Denise’ apple dip because it is aahmaazing and I make it often (like tonight which is what prompted this post). This recipe is extremely versatile and you can personalize it to your taste. You can adjust the peanut butter and sugar to match your taste and include whatever add-ins you want. My aunt likes to add caramel balls and mini M&Ms instead of the mini chocolate chips. My favorite version is below. Whip the cream cheese with an electric beater. Add peanut butter and whip it until light. Add the sugar until well blended. Mix in the chocolate chips and heath chips. Serve with sliced apples. Today I had lunch with a dear friend from my teenage years … Kelly Wakild White. Back then I so admired her vivacious and magnetic personality and 20 years later I still do. That chick has not changed one bit and my esteem for her hasn’t either. She is stinkin’ hilarious and a darling. She recently moved to Oldham County, KY from a neighboring county and so I suggested we visit one of my favorite eating spots in LaGrange: One Nineteen West Main. LaGrange. We’re talking train-running-through-the-street-mere-feet-away-from the-turn-of-the-century-buildings quaint. The restaurant’s menu is full of clever versions of local favorites like homemade kettle chips, “Haute Brown” or “Thanksgiving Dinner on A Bun” (all fabulous, by the way) that satisfy my cravings for real comfort food. Living in the Caribbean for so long has given me a deep appreciation for food that is familiar and cozy. The waitstaff at One Nineteen West Main is friendly and warm, suggesting their favorites dishes and offering sweet tea, lemonade or Coke products (so ya’ll know you’re in the South). And the witty menu descriptions of each dish accentuates the whole experience to make it feel like you’re in a conversation with your funny favorite next door neighbor. 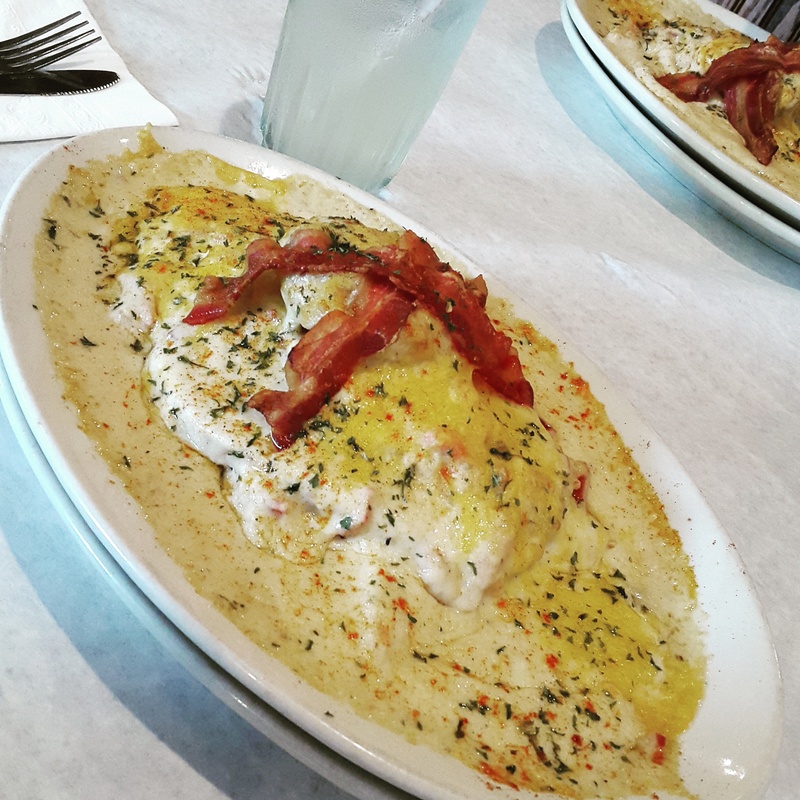 Besides … who can resist the Kentucky Bacon Pie? Creamy caramel filling blessed with pralines, chocolate chips, diced bacon (yes, really!) on a scratch-made pretzel crust with a mocha whipped cream topping! They say “think chocolate-covered pretzels or salted caramel — bacon isn’t the main flavor.” Yum! 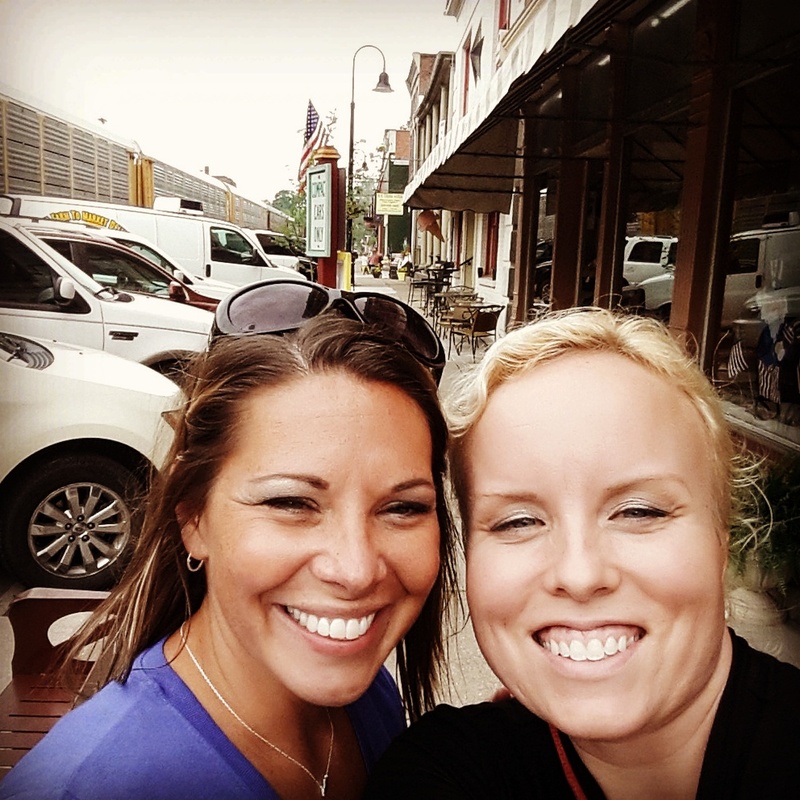 I couldn’t resist sharing this picture of Kelly and I on Main Street LaGrange … squinty eyes and all! very purpose. Then saunter up and down Main Street. I am sure you will be as charmed as I am ever time.